The first of these is a revised lagomerycine, which is not based on Dixon's rabbucks at all. The metacarpals are fused at one end, similar to the feet of tyrannosaurs, and the unguals have become flat and hoof like (resembling the claws of mesonychids more than rabbits). Also note the teeth coming out of the upper portion of the skull. Rabbits today have eight incisors, but only two pairs are actually used. In lagomerycines these incisors come back up through the head, forming horns. This family was originally a mixed group, classified amonst the cheilapithecids and the monacids. However, it now appears that these animals are predatory primates, similar in development to the tyrannopithecids but more similar to the saber-toothed cats in lifestyle. The second finger on each hand bears a massive killing claw, and each claw to the left and right is gradually smaller. Like many other primates in the Metazoic, sphinxipithecids are descended from bushbabies. There are many different genera of sphinxipithecids, such as the predatory Castosarchus, which hunts in family groups to bring down larger animals, and Dryptopithecus, a jaguarundi-like species that hunts in the forests. Metalraptor did these prototype drawings, I personally might make the hind feet of the tyrannopithecids longer for running and leaping. But these are great illustrative views of what might be to come. I have to do a few sketches and some thinking of my own as well, then put all this together. I love the ideas though and I think they will work out well. You could also call the "sphinxipithecids" reaper lemurs...sounds very evocative. I used the name sphinxipithecids because of the connotation of the ancient sphinx; i.e. a cat-like animal with a primate head. This is somewhat similar. Also please not the teeth of sphinxipithecids are few and large, working like meat-shears to cut through carcasses. Metazoica, if you want to put sphinxipithecids and tyrannopithecids together, you could put them both in the superfamily Sarcopithecoidea, or else make Sphinxipithecinae a subfamily of Tyrannopithecidae. I like "reaper lemurs", it does sound good. Though at first I did make Dryptopithecus a real monkey and Castosarchus an ape. I love your ideas though Metalraptor. I will consider them. The lagomerycines, I need not think further about them, I like that idea. And it looks just odd enough to be a creature of the future. I will no doubt be using that one. 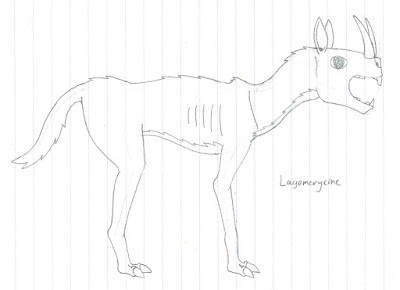 I also had an idea for a large, robust lagomerycine, one whose horns are used for intraspecific fights, and is rather like a bison. Whenever you're done with it, let me know. I'd love to see it.